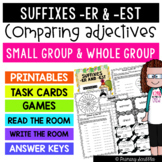 Also included in: Suffixes Bundle of Activities: PowerPoint, Craftivity, Games, and more! 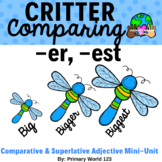 Critter Comparing -Suffixes "-er", "-est"
This ppt teaches the students to understand the suffixes er and est and their meaning when added to a word. 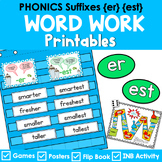 It also teaches them how to spell the new words when the suffix is added. 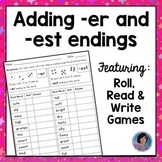 This item includes 24 word cards that can use the endings-er and -est. 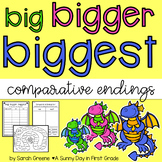 These cards can be used on as a scavenger hunt, whole/small group lessons on comparative endings, or a center activity. 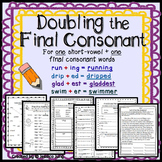 There are also two different worksheets included with this item. Pick a word endings card, and draw a picture that shows the base word. 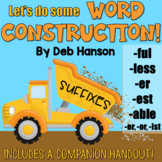 Add an er and est suffix ending to the word, and draw pictures to show the picture to visualize the different word ending suffixes. This is simple and easy activity! This is great for a learning center!